"The Collector's Guide to Psychedelic Rock Concert Posters, Postcards and Handbills 1965-1973"
Finding these posters can indeed be a daunting task, and remember, condition is everything. These posters were usually actually used to promote the shows or as decorative art tacked on the wall, and thus most are in less then near mint condition (some say a poster is never in mint condition after it has left the print shop). To me, this is the beauty of these posters, and most of my posters are definitely used, with tack holes, folds, slight tears, etc. The image is what is important to me, and if it is fairly intact, not faded too much, and still has it's original shape (no missing corners, etc. ), I will grab the rarer posters. 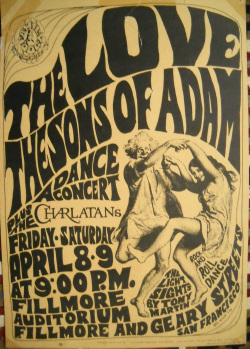 Posters can be found many places, from eBay to the large commercial poster sites such as Fillmore posters, Rock Posters, Sixties Posters, and Wolfgang's Vault. Wolfgang's Vault offers the world's largest collection of rock 'n' roll memorabilia, including an unparalleled collection of vintage and retro apparel, poster art, and the exclusive online libraries of some of rock's greatest photographers. Wolfgang's Vault also hosts Concert Vault, which provides listeners access to thousands of live concert recordings from the Bill Graham archive, King Biscuit Flower Hour, Silver Eagle Cross Country, Dawson Sound, Record Plant, Ash Grove, and Newport Jazz and Folk Festival collections.